Let's assume you've defined RadDateTimePicker as shown in Example 1. 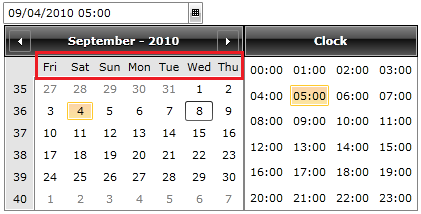 You can then set the FirstDayOfWeek property of the current culture's DateTimeFormat as demonstrated in Example 2. Another way to achieve the same result is to define a style targeting the RadCalendar control and add a setter for the FirstDayOfWeek property. Example 3 demonstrates such a style. If you're using implicit styles, you should base your style on the RadCalendarStyle. You can then use this style implicitly or set it for a single RadDateTimePicker instance through the control's CalendarStyle property as shown in Example 4 and Example 5. If you're using implicit styles, you should base your style on the RadDateTimePickerStyle.